Kresgeville is an unincorporated community in Monroe County, Pennsylvania, United States. Kresgeville is located on U.S. Route 209, 6 miles (9.7 km) west-southwest of Brodheadsville. Kresgeville has a post office with ZIP code 18333, which opened on January 5, 1846. This climatic region has large seasonal temperature differences, with warm to hot (and often humid) summers and cold (sometimes severely cold) winters. The Köppen Climate Classification subtype for this climate is "Dfa" (Hot Summer Continental Climate). Sebastian Spering Kresge, the founder of K-Mart, grew up in Kresgeville, which was named for his ancestors. 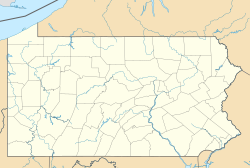 Wikimedia Commons has media related to Kresgeville, Pennsylvania. ^ "Kresgeville". Geographic Names Information System. United States Geological Survey. ^ "Postmaster Finder - Post Offices by ZIP Code". United States Postal Service. Retrieved November 25, 2011. ^ Leiser, Amy (December 2007). "Kmart Founder's Life Begins, Ends Here". monroehistorical.org. Monroe County Historical Association. Retrieved 1 February 2015.